22% of Belgian businesses with 50 or more employees on site indicate that they use a solution for Unified Communications. We noted that growth with this solution tended to stagnate last year. The current percentage is pretty much at the same level as a year earlier, but somewhat higher than 2 years ago. We were previously used to growth of a number of percentage points per year. For instance, in 2013, 14% of the sites had Unified Communications. 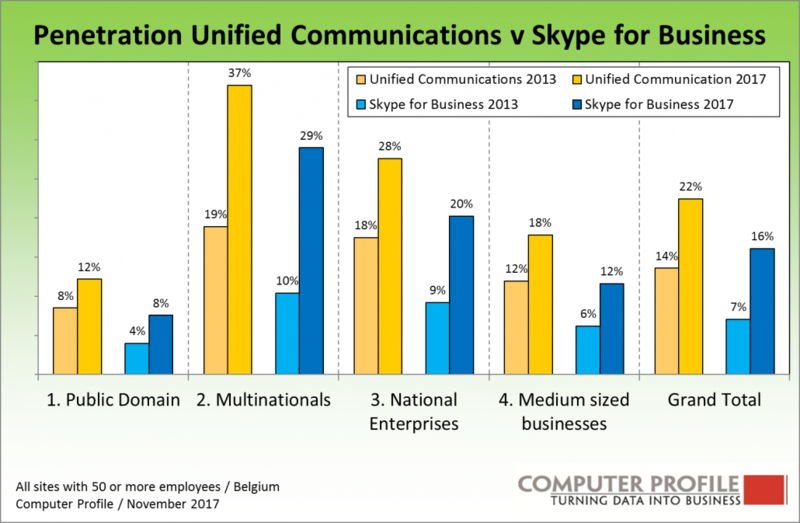 The most prevalent solution for Unified Communications that we encountered in Belgian sites by far is the Skype for Business application: 16% of the interviewed locations have a Skype for Business application at this time. Here once again we see that the strongest growth seems to be a thing of the past, namely in 2012 and 2013, when use went from a few percentage points to ca. 14%. This is shown by an analysis by Smart Profile based on interviews with more than 3,700 Belgian sites in the last 12 months. Whereas Lync used to be a separate server solution, Skype for Business can also be obtained alongside a(n) (on premise) server version via the Office 365 licence. A part of the dissemination of Skype for Business is linked to the increased use of O365. It is not always clear whether and to what extent the possibilities of Unified Communications within the O365 licence are used. For instance, one company can use the possibilities of Skype for Business by using videoconferencing, share files and replace the telephone exchange with the Skype for Business Server, while another uses only the messaging function of Skype for Business. Sectors where the use of Unified Communications is above average are: ICT & Utilities where the use of UC is 44% and of Skype for Business 33%, the transport sector, where 31% indicate that they use UC and 25% that they use Skype for Business, and sites in the Finance & Services segment, with a UC penetration of 29% and Skype penetration of 22%. A precondition for Unified Communications is the availability of IP lines (for communication). VoIP is usually the first feature used. 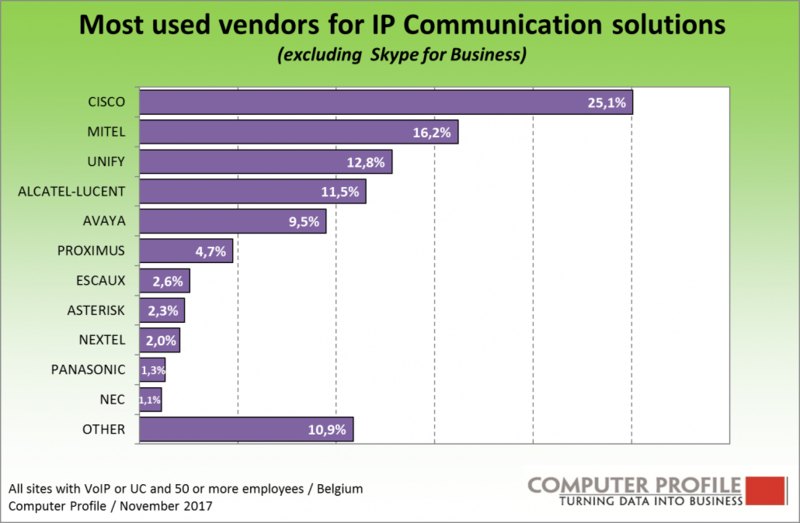 The use of VoIP among the interviewed Belgian sites currently stands at 51%. Four years ago that was ca. 48% and in 2009, it was less than a third of the sites. Here once again we see that the outlier sector is ICT & Utilities, where three quarters of the sites use VoIP. When the use of VoIP is considered in relation to the size of the company, 47% of the sites with 50 to 100 employees use VoIP; 50% of the sites with 100 to 200 employees; 58% of the sites with 200 to 500 employees; and ca. 60% of the sites with more than 500 employees. When the vendors of solutions for VoIP and Unified Communications are considered, we see that Cisco is the most prevalent party. A quarter of the solutions encountered on the two aforementioned segments involves a Cisco application. We leave the use of Microsoft Skype for Business (and its precursors) out of consideration (the use of Skype for Business is ca. 1.6 times as large as the use of the Cisco solution). Cisco registers its largest share in sites of Multinationals. Nearly half of the VoIP/UP solutions in that segment involve a Cisco application. Mitel accounts for 16% of IP solutions overall. The Canadian company registers its highest share (26%) in sites of National Enterprises (commercial companies with 250 to 2,500 employees in Belgium). Unify ranks third with a 13% share, its strongest segment being the public sector (17%). Alcatel-Lucent has nearly as large a share (12%), and its strongest position is likewise in the public sector, where one out of five VoIP/UC solutions is one of theirs. Avaya rounds off the top 5 with a 10% share, and has its largest share among Multinationals too (16%). Videoconferencing solutions can be part of a solution of Unified Communications as a standard, albeit not by definition. 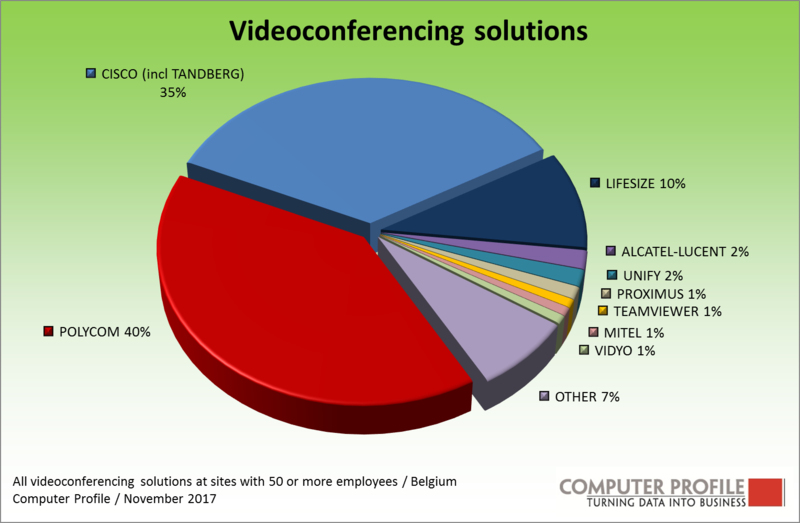 That is why the target group (Belgian sites with 50 or more employees) was interviewed separately about the use of videoconferencing solutions. Polycom is the most prevalent application for videoconferencing among Belgian sites, with a 40% share. In 2016, Mitel attempted to take over Polycom, but this attempt ultimately failed when the investment company Siris Capital made off with the prize. Cisco is the second largest vendor in this field, with more than one third of the videoconferencing solutions – including those of Tandeberg (acquired). Lifesize, now independent from Logitec, ranks number three, with a 10% share. The use of videoconferencing solutions is on the wane. We see a declining penetration for videoconferencing solutions as of 2013, when 23% of the sites indicated that they used such a solution. That figure is now 13%. Online videoconferencing possibilities have increased in recent years, lowering the threshold for videoconferencing. The use of classic videoconferencing solutions at the boardroom level will persist for some time still, but the levels below it will switch more frequently over to online tools which, with a built-in or loose webcam, will constitute a cheap alternative.